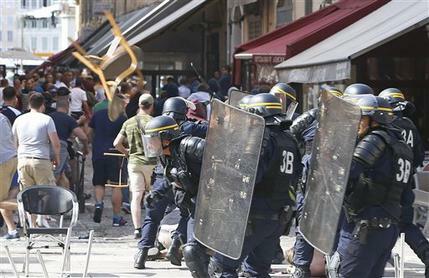 Marseille prosecutor Brice Robin says 150 specially trained Russian hooligans were behind much of the violence that broke out in Marseille ahead of the England-Russia game on Saturday (June 11). Robin spoke after a weekend of violence in the French port city ahead of the European Championship soccer game on Saturday, which ended in a 1-1 draw. About 35 people have been injured, including four people whose conditions were described as serious. Robin told reporters Monday (June 13) that while “almost of those who were wounded were British,” England supporters were also responsible for some of the violence. He said 20 people have been arrested. Ten of them – six Brits, an Austrian and three French – will face immediate trial.